So, you have decided to take the family to Royal Natal National Park this summer, and you thought that while the wife and kids are asleep, you might sneak out and indulge in a little early morning photography. After all, the park is home to the renowned Drakensberg Amphitheatre and when in the presence of greatness, you must shoot! The only question is where to shoot from? There’s no time for an epic walk-in. What you need is a grand view without grand effort and to help with that, here is a list of locations that you might consider trying. The most obvious location for photography in the reserve, this little tree-lined reservoir near the picnic area has seen more than just 15 minutes of fame over the years. With postcard-perfect reflections of the Amphitheatre and trouble-free access, most park visitors will snap a shot here at some point. Don’t be put off by the dam’s popularity, though; it is often completely deserted at sunrise and securing a good image from this tranquil vantage point remains an intensely rewarding experience. 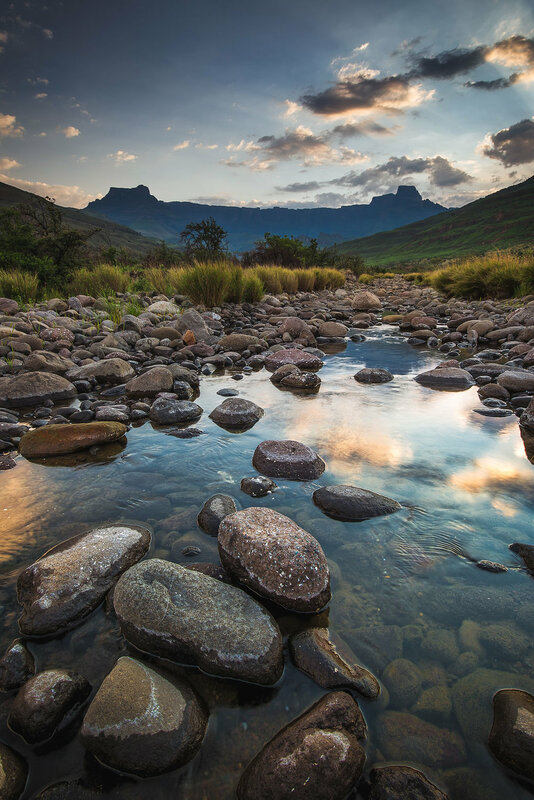 Unlike the idyllic atmosphere of the dam, photographs of the Amphitheatre taken from the Tugela River show a hostile side to high mountain life. These views are a more honest interpretation of the Drakensberg with the rocky riverbed and imposing cliffs. If you are lucky, you will catch the Tugela during a period of heavy flow, and be afforded particularly dramatic images as the torrent washes yet more boulders towards the sea. The best place to witness this display of power is from the secluded lay-by en route to the Tunnel parking lot. This forgotten viewpoint once offered visitors to Royal Natal their first real Amphitheatre vista as they crested the hill above the reception. Today, though, the views are rather obstructed, dense Drakensberg foliage having intruded on the old benches that people once used when admiring the spectacle. Nevertheless, with a little ingenuity, it is possible to peer through the undergrowth and to snap one of the more unique Drakensberg scenes. A few hundred meters down the hill from the Thendele Camp, the little Berg flattens out briefly before continuing its descent towards the Tugela. From this little mountain step, the Amphitheatre has a commanding presence. It is as close as you can get to the craggy ridge without lacing up your hiking boots. It is also a particularly good spot for sunset photography, that is, if you can sneak away from camp. If you enjoyed this article, then please remember to give it a 'like' below! Copyright © 2019 W L KING (PTY) LTD. All rights reserved.